Mmmm, that looks amazing. For me it's this dal recipe. That sounds delicious! Will have to try it out! 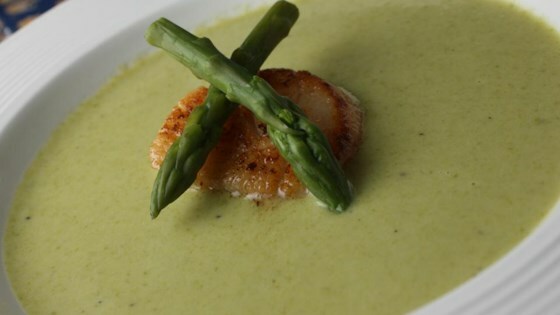 One of my favorite soups is Cream of Asparagus. My favorite recipe isn't fancy, but it's reliable, inexpensive and easy. It's the one I turn to when I want to get something healthy on the table for my crew faaaasst. Blend it in a Vitamix, heat it up and enjoy. Fancy it up with green onions or cilantro on top. Notes: I usually cook my own beans so I just use 3 1/2 cups cooked beans. I also use my own veggie bouillon I keep in the freezer so it's really 1 1/2 c. water + 1 1/2 tsp bouillon.